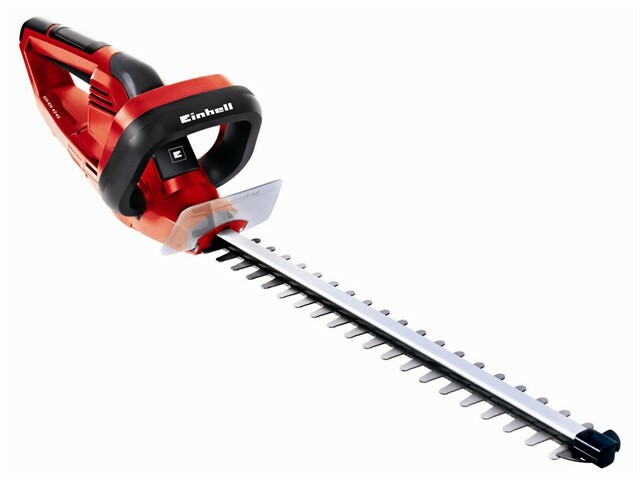 The Einhell GH-EH 4245 Electric Hedge Trimmer is fitted with a counter-rotating, double-bladed safety cutter that is made of diamond cut steel that has been laser cut to ensure excellent cutting results. For efficient power transmission there is a robust metal gearing that provides increased working life. The two-hand safety switch and the large hand guard ensure safety during working. The additional handle and the softgrip on the main handle allow for user-friendly, ergonomic operation increasing work time. There is also a stress-relief clip that protects the power cable from wear.